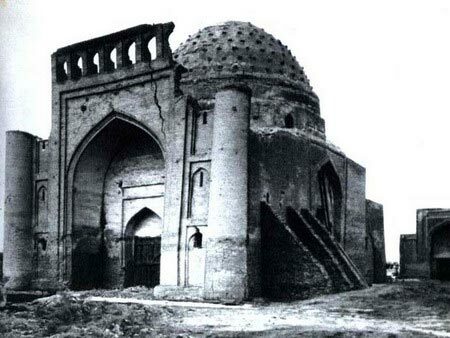 In the beginning of the XIII century, the Sufi order of Kubravi was formed to the east of medieval Bukhara. Locating in district of Fathabad, the order built special houses - khanqah, in which the poor and the sick found the shelter. One of the brightest representatives of the Sufi order was Sayf ad-Din Boharzi, who lived in the years of 1190-1262. As the young follower of the new Sufi teaching, he survived the Mongol invasion, during which the founder of the order of Kubravi - Nadzhimddin Kubra – was killed. Boharzi became the famous poet and theologian, receiving the title of "Sheikh of the world" in the end of his life. After his death, near his tomb the khanqah was built, which became the shelter for hundreds of poor people from all over the neighborhood. And some time later, the mausoleum was erected over the grave of a righteous man, standing little more than a century. In the end of the XIV century the new mausoleum was founded on its site, which today attracts by its architecture, combination of simplicity and gracefulness, proportion and lack of decor. The entrance portal of the mausoleum was erected much later, but it also is not distinguished with colorful decoration. The only evidence of proficient work of architects is the headstone, embodying the best of medieval carving - the author was able to create the picture in which the floral design is interwoven with inscriptions in Arabic. During its history, the mausoleum has passed through several reconstructions and restorations, but the mausoleum loses the battle against time - after the major earthquake in 1976 the dome of building has almost collapsed, not rich external decoration has been lost. Today, it is presented not in the best shape, but one look is enough to feel at once the age of this building.